Free Delivery on orders over £20. Exclusions apply. Pull up to the Foam Cone Factory and make your own pretend ice creams with soap and water! Bath times will soon be more like a visit to the seaside. That’s because customers are queuing up at the Foam Cone Factory from Tomy. This clever unit pops onto any bathroom wall or the sides of your tub with its suction pads and only needs a little bubble bath and water to operate. 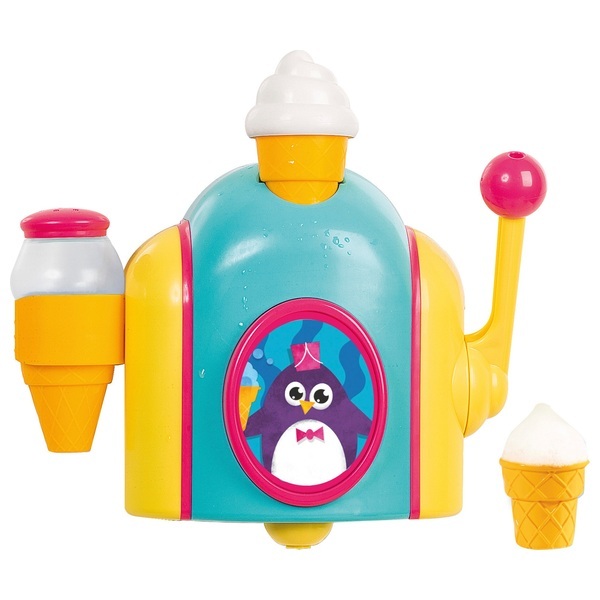 Kids can make their own pretend ice creams simply by dripping a few drops of bubble bath into the cornet at the top… adding water… and pulling the lever. They’ll love watching as the “ice cream” fluffs and bubbles up in the cone before their eyes. It’s magic. Three flat- bottomed cones are designed to sit steadily on the sides of the bath, ready to add pretend sprinkles from the shaker that comes as part of the set.